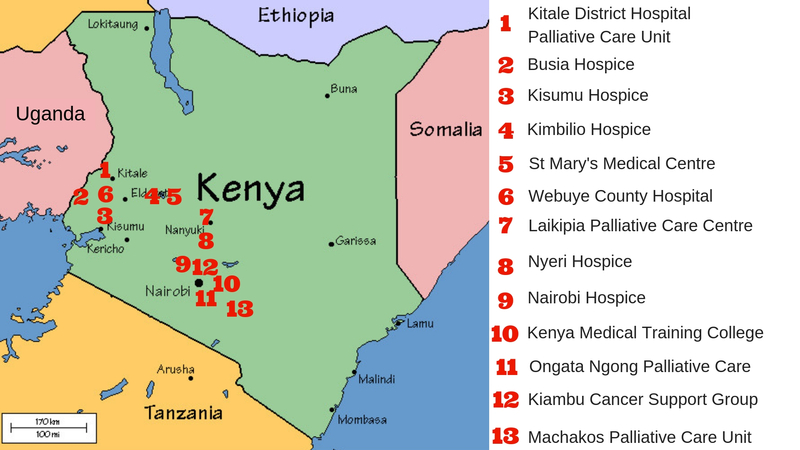 We are currently supporting 13 Hospices, Palliative Care Units and Training Programmes across Kenya, to provide quality palliative care, and train health workers and community volunteers. Kitale District Hospital Palliative Care Unit is expanding to enable them to accept more patients. We are supporting the purchase of new equipment, supply of pain relief drugs, community awareness campaigns to ensure that the public know that palliative care services are available to them, and home visits to provide care to isolated and house-bound patients. We have also provided funding to train 25 community health volunteers in palliative care. Busia Hospice is training over 30 community health volunteers to support palliative care provision in the community. We also support the two hospice nurses with a small stipend as the hospice has no local income. At Kisumu Hospice we are funding the supply of morphine to ensure that patients do not have to live with pain. We are also supporting the training of 60 community health volunteers to expand the reach of palliative care services into the community. Over the past year we have supported Nyeri Hospice in providing palliative day-care at their outpatient clinic for over 100 patients. To provide access to palliative care for the large rural population, 60 CHVs are being trained to reach the most rural and isolated areas. We are supporting Nairobi Hospice to train 25 Community Health Volunteers in Kawangware slum, giving some of the poorest patients in Nairobi access to palliative care. We are sponsoring 11 students to complete a Higher Diploma in Palliative Care Nursing at Kenya Medical Training College, Nairobi Campus. Ongata Ngong Palliative Community Care is training 90 Community Health Volunteers to care for patients and raise awareness of cancer and palliative care in their communities, with our support. There is no hospice in Bungoma County, western Kenya, so with our support, Webuye County Hospital will train 30 general health professionals in palliative care to bring this vital service to local communities. We are supporting Kiambu Cancer Support Group to train 20 community health volunteers to expand the reach of palliative care services into the community. We are supporting Kimbilio Hospice to run their outreach programme, Tumaini Na Afya, meaning Hope and Health in Swahili. Our funds are supporting home visits to patients for care and bereavement support, as well as telephone support to patients and family members. Laikipia Palliative Care Centre will train 30 community health volunteers with our support, to extend services out into the community. We are supporting Machakos Palliative Care Unit to train 30 health care professionals, including nurses, medical officers and social workers, at Makueni County Referral Hospital. This will improve palliative care provision in the county and facilitate referrals for patients to the palliative care unit, ultimately helping to integrate palliative care into the health system. St Mary’s Medical Centre is carrying out home visits to provide home-based palliative care for patients and bereavement support for families. They will also train community leaders and volunteers in palliative care awareness.